The Kansas River Map provides comprehensive information on the several rivers, streams and lakes flowing through the state. The Republican River, Arkansas River, Kansas River, Smoky Hill River, and The Missouri River are the important rivers of Kansas. The Missouri River flows through the northeastern part of the state. The Kansas River flows across Topeka and meets the Missouri River at the Kansas River. The Arkansas River flows through the Wichita region of Kansas state. The lowest point in Kansas is the Verdigris River, which is 680 feet in elevation. The state of Kansas has several man made lakes and about fifty thousand streams. Waconda Lake, Tuttle Creek Reservoir, and Cheney Reservoir are the major lakes of Kansas. Kirwan Reservoir, Milford Lake, Wilson Lake, Marion Lake, Cedar Bluff Reservoir, John Redmond Reservoir, El Dorado Lake, Pomona Lake, and Perry Lake are the other notable lakes within the state. Cottonwood River, Neosho River, Pawnee River, Saline River, Solomon River, Cygnes River, Marmaton River, Walnut River, Big Blue River and Chikaskia River are the other prominent rivers of Kansas. 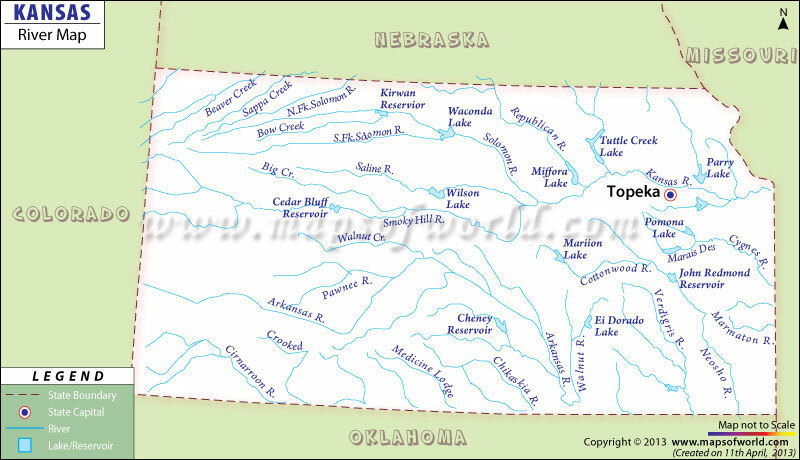 The Kansas State Map points out the diverse topography that has been formed by the several rivers and lakes of the state.